Is Choquequirao as impressive as Machu Picchu? This ancient Inca city is known as the younger sister of the Wonder of the World. Some tourists who made the 2-day walk to visit it even say that Choquequirao is better. It is true? Know the truth about this new archaeological site in Cusco, Peru. Is it worth visiting Choquequirao? How is the architecture in Choquequirao? What to see in Choquequirao? How is the trek towards Choquequirao really? How much does it really cost to go to Choquequirao? Can I visit Choquequirao without a tour? Choquequirao is an Inca urban center with features common to others more than Cusco, especially Machu Picchu. The similarity with Machu Picchu is due in large part to the similar geography of the place where the site was built. According to various investigations, Choquequirao would also be a fortress and a ceremonial center. The truth is that due to its hidden location in a high and distant mountain; It was a strategic point for various purposes. Over the years, like Machu Picchu, Choquequirao was abandoned and covered by the jungle until its re-discovery. Unlike Machu Picchu, there is no train or bus to get to Choquequirao. The only way is to do it on foot for 32 kilometers of incredible landscapes. The only way to get to Choquequirao is by walking. There are 3 days of roads (round trip) including the route through Choquequirao. The trek to Choquequirao makes visiting this inaccessible place a difficult but memorable adventure. 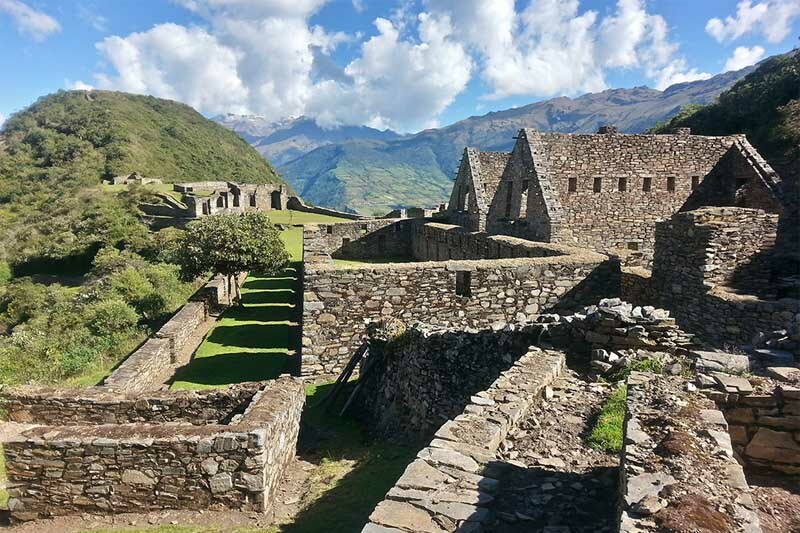 Once in Choquequirao, the tourist will be practically alone with an archaeological site as spectacular as Machu Picchu. The few tourists in the world who visited Choquequirao agree that it was worth it. Choquequirao is located at 3,103 meters above sea level in a privileged location: it lies on the impressive canyon of the Urubamba River. It is located in the foothills of the Salkantay mountain, in the Apurímac valley, in the province of La Convención in Cusco, Peru. Choquequirao means ‘Cradle of gold’ in Quechua. It is considered the city ‘Sister of Machu Picchu’, for its similarities with the Inca City. In truth, its architecture is as impressive as that of Machu Picchu. At the moment, Choquequirao has the advantage of not receiving the number of visitors that its ‘Big Sister’ receives. There are few people who know Choquequirao. Maybe due to the difficult walk that takes to get there. Choquequirao has numerous Inca buildings. However, currently only 30% of its entire area has been excavated. Its most important buildings are built with quartzite, cut in great detail. The rest of the walls are made of raw stone. These walls were covered with clay both inside and outside. It is believed that the walls of Choquequirao were painted light orange. Although in reality there are few structures that continue with this coating. The ancient city of Choquequirao has two main squares, temples, fountains, canals, workshops, warehouses, elite residences and other more common ones. The ceremonial center of Choquequirao is a large platform that can only be reached through a double jamb door. The biggest buildings of the place are the colcas (warehouses). 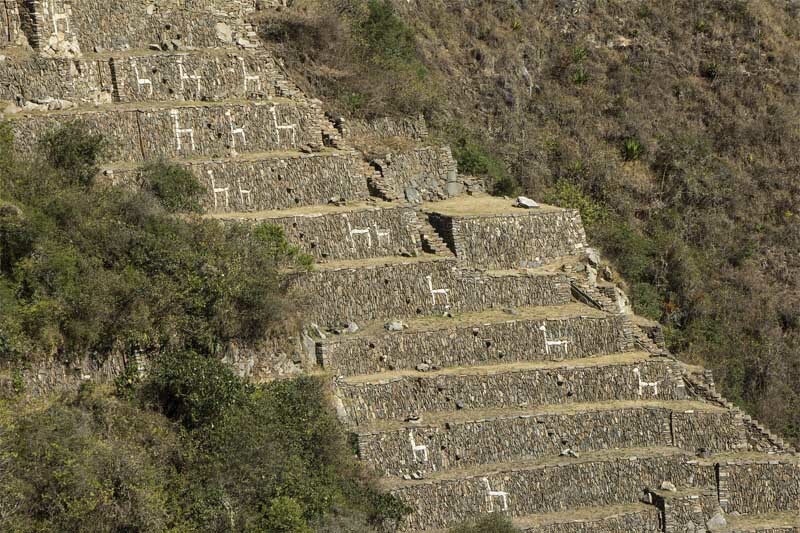 Like Machu Picchu, Choquequirao has structures that mark solar events as solstices and equinoxes. Among the most impressive structures in Choquequirao, there is a huge staircase that at dawn of the summer solstice is illuminated completely by the sun’s rays. In truth, the walk to Choquequirao is demanding. The ascent to Choquequirao begins in the town of Cachora (164 kilometers by car from Cusco). The road is in ascent crosses places of the Apurímac valley like: the Capuliyoq viewpoint, the Chiquiska camp, Marampata and others. Obviously, the climb is more demanding than the descent.Choquequirao is in the middle of the departments of Cusco and Apurimac. The descent path belongs to the department of Apurímac while the climb belongs to the department of Cusco. Choquequirao is a tourist attraction that can be done with a tour or without a tour (on your own). Obviously, the cheapest way to go to Choquequirao is on your own. However, the safest way is to do it with a tour. The tour to Choquequirao costs between 400 and 600 dollars depending on the tourist agency and the number of tourists. Going to Choquequirao on your own is cheaper. The necessary expenses are the food (for 3 days), the camping implements and the entrance fee (18 dollars for adults). The visit to Choquequirao can be with a tour or on your own. The tours cost between 400 and 600 dollars. The visit without a tour, much less. Unlike the Inca Trail to Machu Picchu, Choquequirao is a destination that can be visited without a tour. To go to Choquequirao on your own, you must organize the hike (luggage, food, camp) and pay the entrance at the same door of the archaeological site. When going to Choquequirao on your own, the visitor is your own guide.You must organize your luggage and take all necessary precautions. During the walk to Choquequirao, the tourist can choose between many places to spend the night. It is estimated that a camp can be found every 3 hours. There is an alternative route that connects Choquequirao with Machu Picchu. This adventure begins in Cusco and lasts 8 days and 7 nights. In Choquequirao a cable car will be built that will connect the archaeological site with a neighboring town. This would facilitate access to the Inca site. In 1909 (2 years before the ‘discovery’ of Machu Picchu), the American explorer Hiram Bingham arrived in Choquequirao. 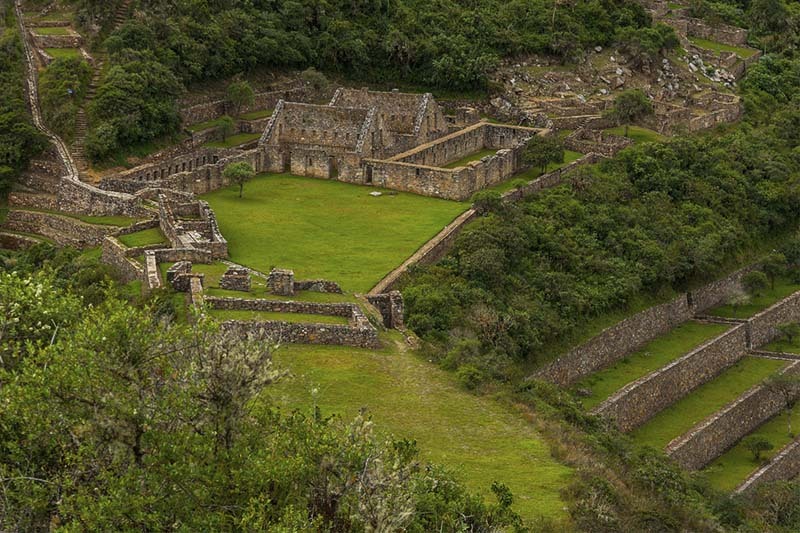 Like Machu Picchu, the Incas built Choquequirao in a strategic position on top of a mountain. This allowed them to have a privileged view of the environment.